Podcast 015 – Dark Souls 2 lore on The Doors of Pharros. Plus the opening of Brightstone Cove Tseldora. – Entries due 17th August 2014. – All guidelines listed here. We value feedback of all kinds. If you have constructive criticism or suggestions this episode is a designated time to send it through. 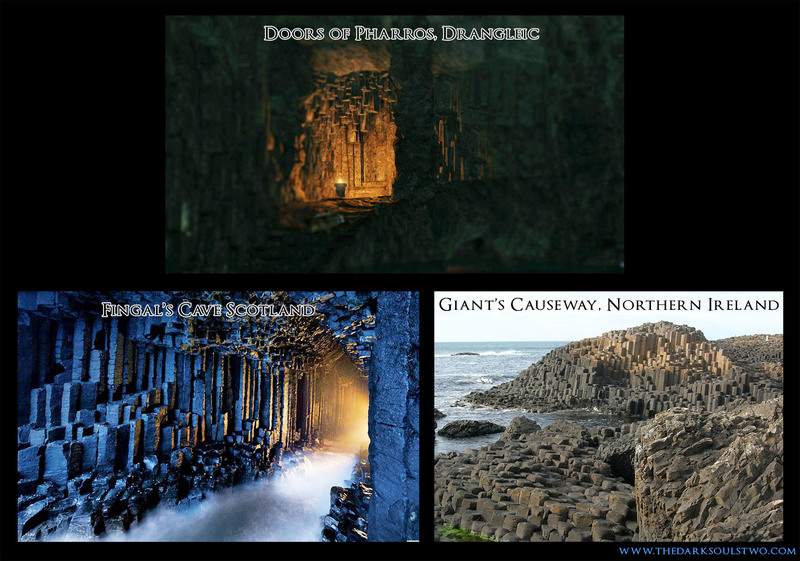 – Presumed inspiration for the Doors of Pharros – The Giant’s Causeway and Fingal’s Cave. I suspect that Pharros the Wanderer had some connection to the Prince of Alken and the Princess of Venn. The only way to get to Belfry Sol or Belfry Luna is by using a Pharros lockstone. In other places the stones hide shortcuts or loot, but never entire regions. If I’m right, there’ll probably be more hints in the second DLC. The red orb that popped out of the chest you had never seen before is a lifedrain orb. It basically drains your life for as long as it is around. I’ve only ever came across it once, it doesn’t appear as often as what the poison and arrow trap chests. On a side note, keep up the great work guys, I came across your podcast a few weeks ago and watched all of them over the course of a day. I enjoy your theories and occasionally I get a new idea or perspective of an area which always excites me. I shall look forward to EP16 and what you think about the Duke and such. I’m really enjoying the podcast, and I have a few comments about the last podcast. Regarding the well in the beginning of Brightstone Cove Tseldora, it isn’t a difficult jump if you don’t jump. Just run off the path and you will almost never miss it. I have missed it only once, funnily enough, right after I posted somewhere else that I had never missed it. I have killed all of the pesants with the second falling boulder using the spell Yearn. If you put it in the right spot (which took me several attempts) and trigger the boulder to fall, you can kill all of them at once. I’m sure that using an alluring skull would work as well. One of you mentioned that the spiders will come out if you don’t open the chest in the room before the Magus. I have never had that occur. I have run through that room many times and when I have ignored the chest, the spiders never come out of their holes. I have never stayed in that room for a long period of time, so maybe they eventually do. However, passing through that room with Benhart in tow, opening the door, retrieveing the estus flask shard, and then starting the fight with the Magus has never been interrupted by the spiders.